DNA Links Bloody Handkerchief To French King's Execution : The Two-Way In France, a team of scientists says that a piece of cloth dipped that was reputedly dipped in the blood of Louis XVI is genuine. The monarch was executed 220 years ago this month, during the French Revolution. Scientists have established the authenticity of a cloth dipped in the blood of France's King Louis XVI. A memorial depicts the executed king and Queen Marie-Antoinette at Saint-Denis, near Paris. In France, a team of scientists says that a piece of cloth that was reputedly dipped in the blood of Louis XVI is genuine. Louis XVI was executed 220 years ago this month, during the French Revolution. The handkerchief had been stored for years in an ornately decorated gourd, as Tia Ghose writes at Live Science. "According to a special tradition practiced during executions of France's elite, spectators were invited to dip their handkerchiefs in the blood as a 'souvenir.'" "On one such rag, in the hands of an Italian family for the last century, was inscribed, 'On January 21, Maximilien Bourdaloue dipped his handkerchief in the blood of Louis XVI after his decapitation.'" The recent DNA tests prove that the hanky does indeed contain Louis XVI's blood. Perhaps more strikingly for historians, the tests also establish a firm genetic link between the ill-fated king and King Henry IV, who ruled from 1589 to 1610. 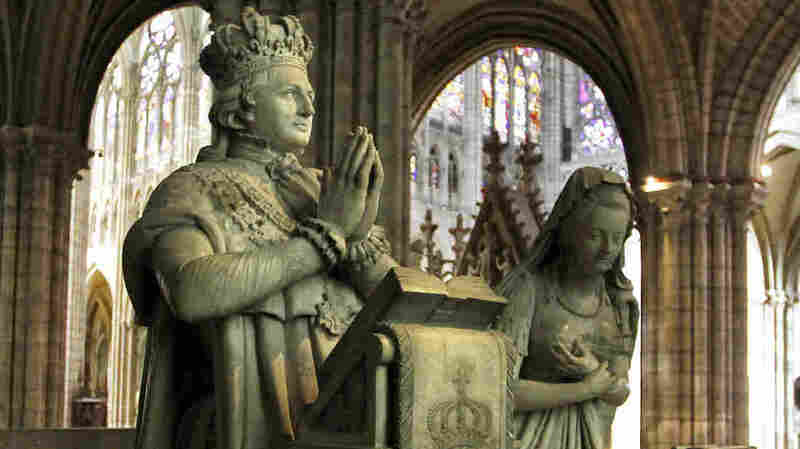 Henry IV's mummified head was removed from his tomb by revolutionaries who pillaged the Cathedral Basilica of Saint Denis in 1793, the same year his descendant died by guillotine. "Recovered in 2008 after several centuries of peregrinations, the head had been authenticated in 2010" by a team of 20 specialists, reports France's Le Monde. The familial link is now proven with "95 percent confidence," the scientific team reported in the journal Forensic Science International. "The genetic material from the two men shows they are relatives through the paternal line," Eleanor reports. "The team of scientists detected a rare genetic signature shared by the two men, despite their being separated by seven generations."